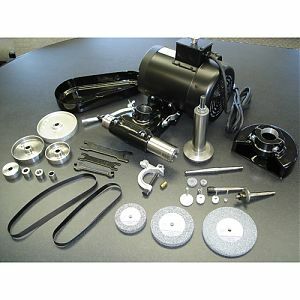 For internal and external grinding capacity, grinder is suitable for 9-20" lathe swings. Features include nine spindle speeds and coil spring applying constant belt tension, assuring proper alignment. Wide range of spindles is available for tool room and production line needs. Please note pictures listed are for the sets. • Motor: 1 Hp. Induction motor, TEFC. 220/440V, 60Hz. 3 Phase, AC only. • External Grinding Capacity: to 6" diameter wheels. • Internal Grinding Capacity: to 15" depth. • Grinding Speeds: 3,600-32,00 rpm. • with 7 pulleys, 3 flat belts, diamond wheel dresser and sturdy carrying case. (Spindles not included - order separately - see Series 57 spindles for ordering info).